There is a Romanian folk song with the lyric, ‘There are many paths across the fields; each one was made by a young man to get to his girlfriend’s house’. This sentiment might sum up Christoph Simon’s charming fourth novel, Zbinden’s Progress: romantic almost to the point of being sugary, but nonetheless about how humans connect, and how those connections might manifest themselves in the world. 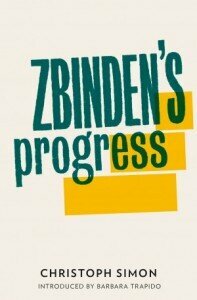 Structurally Zbinden’s Progress is one of those books that begins at a near-end point, in a care home for the elderly, and unwinds piece-meal the largely domestic history of Lucas Zbinden and his beloved wife Emilie, whose death from cancer forms the traumatic heart of a book otherwise characterised by an appealingly philosophical levity. Speaking in the first person, Zbinden has a highly distinctive voice that, through insistently unanswered address to his carer Kazim, can verge on the overbearing. But Zbinden’s at times cloying garrulousness is a function of his anxiety, common to the elderly, that his age will push him to the margins of his society and silence him. He sees this happening to fellow pensioners, as in the case of Frau Jacobs, who fears ‘being transferred, at some point, to a special-care home. Sedated by medication. Kept there against her wishes. And silenced.’ In order to head off such a fate for himself, Zbinden walks and talks incessantly. Although the novel manages in the main to prevent its carefully managed register from slipping into twee, there are moments which some readers might find a little too saccharine. At times, too, the mechanics of Zbinden’s walk which, Ulysses-like, spans a single day as he is helped around his nursing home can seem a little too overtly a device around which to drape his eccentric walker’s philosophy. But these are occasional twinges that fail to spoil an idiosyncratic exploration of what it means to be an elderly member of society with an intense desire to participate in it, and how as simple a thing as going for a walk might be a way of ensuring that participation despite the restrictions of age.